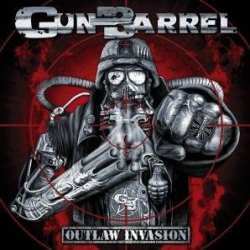 Cologne hard rockers Gun Barrel have just released their fourth album Outlaw Invasion, but I still have some problems with their music. As on their three previous records, you get the usual mixture of hard rock, metal and rock’n’roll which is reminding of bands like Victory, Saxon, Rose Tattoo and AC/DC. At first that doesn’t sound so bad, and the opener Front Killers is one of the CD’s highlights. Also Wanted Man with occasional Iron Maiden guitar riffs and the sleazier Wild & Nasty, with parallels to Twisted Sister, are among my favourite tracks. The remaining songs aren’t bad, but never really stand out either, except for M.I.L.F. which can be found rather towards the end of the album. Maybe it’s just the title, but this track managed to get me going once again. The cheesy hymn Tomorrow Never Comes should absolutely not have been, as it is even worse than the Scorpions’ Winds Of Change, although it might invite metal fans during a live show to get their lighters collectively out. Apart from this blackout, everything’s ok, although the songwriting is a little to simple for my taste. The production is also beyond reproach, but I wonder if the album had had more power if the band had decided to leave three tracks off, to reduce the running time to forty or forty-five minutes, which works generally better for this kind of music.